David vs Goliath: WhiteAfrican in the 2009 Bloggies Awards! Quite frankly, this is a REALLY long shot, as the sites that I’m up against are some of the biggest tech blogs around – Gizmodo, Mashable and Lifehacker. I mean, really… talk about David vs Goliath. The cool thing is that I’ll be at SXSW this year in Austin for the award ceremony. We need more Africans to get involved with the nomination process as I know there are a ton of excellent blogs with diverse and pertinent content that aren’t represented here. African blog readers need to help get African blogs noticed in more than just the “Africa” category of the bloggies. So, time to represent Africa, let’s see what we can do! Maybe the name of your blog did it! Nah, I’m playing. Good luck in your quest to be the best. I myself am very young at blogging. Experimenting here and there. I like your blog so far. Let me take a tour around it and see. Do readers get to vote for the winners? Hey Screamer, anyone can go and vote. It started with nominations, then went to judges to narrow it down, then finally to the public to vote one last time on the finalists. Congrats Hash! I have voted for you and WordPress. 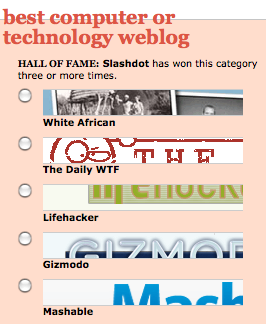 I would have loved to see AfriGadget in the Africa category as well. 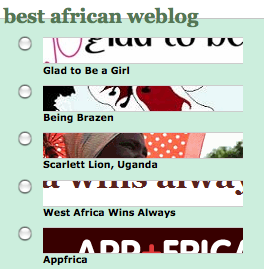 The blogs that are nominated in Africa category are not good at all. The voting system by these guys is much better than the one CNN used for their Hero of Year contest. In the CNN system, one could vote again and again. “That’s my friend!” I say! Congratulations! Looks like some outstanding blogs in that category. Best of luck! Seriously, quite Amazing Hash. Some day I’d like to see you post your stats in a post. How much traffic do you get? Wish I could be at SXSW again. Someday. As cool as Afrigadget is, I honestly feel like it’s turned downward in the last year. Seems like a less posts and the posts are not as good. But I think quantity is the main thing. Can you see how many posts were made in 2008 vs. 2007? Definitely still plan to be a contributor at some point. @zulusafari – You know, I don’t pay that much attention to my stats, maybe once per month I’ll glance at them. What’s more important to me is if I’m putting out what I believe are either good ideas or information. Interesting point on AfriGadget. It tends to be very eclectic, where the types of stories range and differ depending on who the author-of-the-moment is. I hope you do contribute soon, I’d love to see what you can put together. Nice job…..I just discovered your site via the awards page.